Israel is in the midst of a terror wave. We’ve been in other waves of terror, otherwise known as Intifadas, several times in the past. It’s hard to count how many because there are rarely clear beginnings and no clear ends. This one “began” in October. I don’t think I remember the excuse given for this one but I know that the results have been tragic. Some say it began out of revenge for something Israel did, but honestly, that’s nonsense. One thing that marks this period is the level to which the security forces are going to apprehend suspects. Sadly, the greatest efforts to apprehend Arab suspects of terror attacks against Jews seems to be the man on the street…the man with the gun who acts quickly to stop a stabbing attack, a ramming attack, whatever. There are sometimes armed civilians but often these are quick thinking Border guards and other soldiers who realize in the first instances, that before their eyes, they are watching terror happen. Sadly, though, many of Israel’s security forces are engaged in a balancing act, attempting to root out something that exists, but nowhere near the level they suspect. Terrified of appearing to fulfill the baseless claims of those outside Israel (many of whom are funded by Arab groups seeking to offset bad PR that results from the incessant Arab attacks), the Israeli government is indeed hell bent on a witch hunt against right-wing Jewish groups. So, investigations were launched immediately after an Arab child was murdered in an arson attack (his parents later died of their injuries in the same attack). The security forces hinted and the media directly accused many Jewish youth. Administrative Detention is something left over from the time the British ruled this land almost 70 years ago. It gave the British the right to arrest and hold someone without trial. Israel has used this method in the past – primarily when there is an imminent threat of an attack. Justifiable, perhaps, under those conditions…but not when used/abused for political purposes. Three young men…in that shady area of life when a man isn’t really quite a man yet, but still a boy in so many ways…were arrested, including one boy from my neighborhood. They were taken from their homes and accused …of what, we have no idea, but they were tortured, held without given the right to see lawyers and family. Some were tortured – beaten, held until they vomited, kept from sleeping for days. And in the end…so far, only one person has been indicted, at least three have been released with no charges – including the boy from my neighborhood. Can you imagine someone coming to your home…taking your son…beating him, keeping him from you,..torturing him…and then simply releasing him…oops, guess we were wrong? Guess someone gave us bad information? Bummer? Collectively, these boys are referred to as Hilltop youth…simply because they have chosen to live a simple life on the beautiful mountains of our land. They farm, raise animals, learn and are deeply religious young people. I have been to some of these hilltops – some are without electricity…all are filled with love. These are not violent people…these are young men and women, sometimes individuals, sometimes families, who love their land and are deeply religious. They are not violent…for God’s sake, they are farmers and pioneers living in an age when the world doesn’t understand such simplicity. A friend passed this letter to me, asking that people sign it. 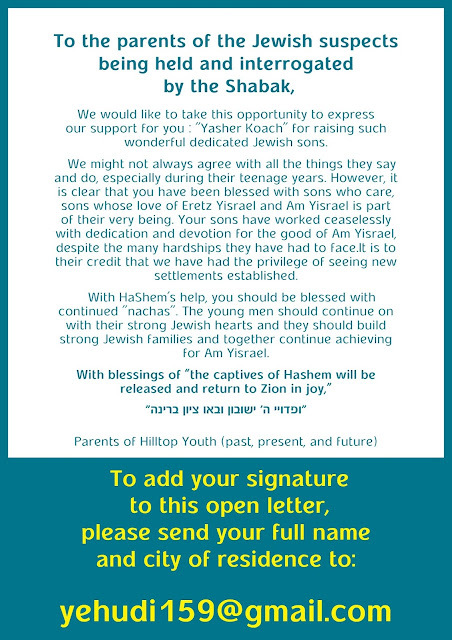 Yasher Koach is a way of saying thank you; it means wishing you strength. Eretz Yisrael is the land of Israel, eternally promised to the Jewish people. Am Yisrael is the people of Israel, eternally promised Eretz Yisrael. Hashem is the God of Israel, Who is above all others. Shabak…well, that’s the Israeli secret security agency that should be focusing on hunting down the people who are stabbing, shooting, ramming, and firebombing Israelis. 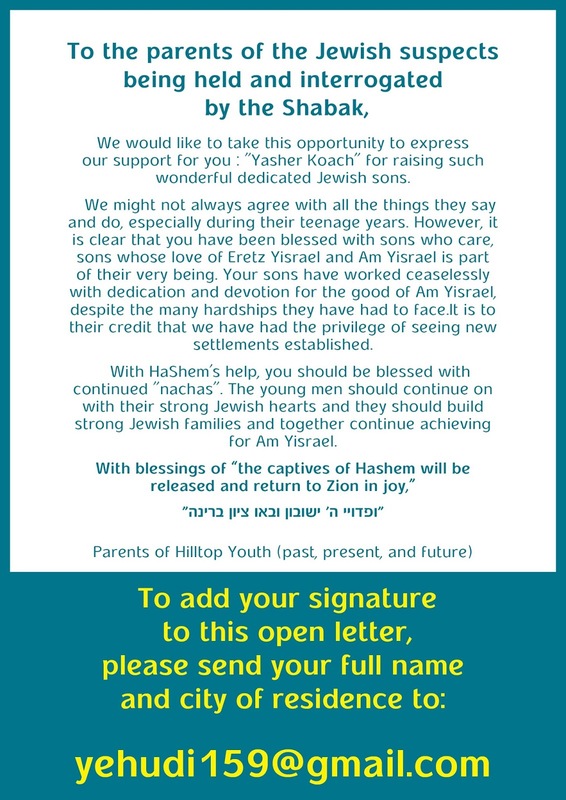 The cost of false accusations is being paid by at least a dozen Jewish youth…please sign this letter of support to their parents and to them. And may the strength of the Shabak finally be turned to fighting for Israel, not against her.